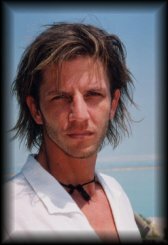 An exclusive interview with the actor Facundo Arana. with the actess Andrea Del Boca. - Facundo, in which series did you play with Andrea? + I played with Andrea in "Zingara". - What was your act there? most difficult thing I had, she was beautiful and attractive. - Did the character "Rudi" change your life a bit? me alot, she is smart and clever. - Would you play a main character with Andrea? + SURE!, if only the ask will come, I surly agree to it. - What do you think about Andrea as an actress and as a person? + Well... Andrea is smart and clever, you can learn from her alot. since the age of 0. - You know, less than a year ago Andrea was her, in the holly land? - What do you think about Israel? + In three words: I Miss There!